Get your free Slurpee Friday! 7-11, Chick-fil-A and Krispy Kreme are offering deals on free snacks, drinks, sandwiches and more. Here are the three you should know about for Friday. 1.Oh Thank Heaven...For Free Slurpees! 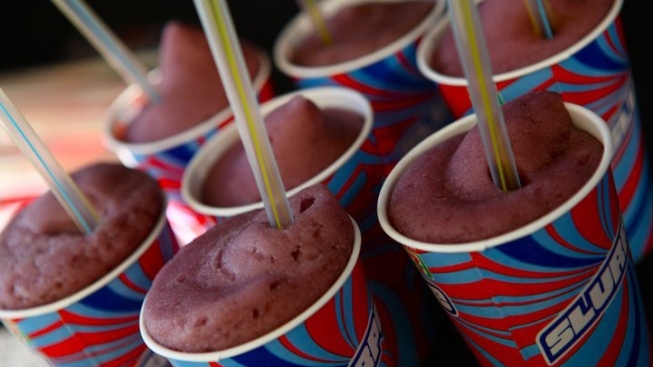 Friday is July 11 (or 7-11), and 7-Eleven is giving out free small Slurpees to celebrate. Swing by any 7-Eleven from 11 a.m. to 7 p.m. to grab a free drink while supplies last. But that's not all. If you download the 7-Eleven app you can enjoy new freebies every day until July 19. Some highlights include Twinkies, Big Gulps and M&M's. Love Chick-fil-A's "Eat Mor Chikin" campaign? Now you can be a part of it! Dress like a cow and show up to any Chick-fil-A restaurant on July 11 to receive a free meal. If you are feeling shy about your love of cows, you can dress in partial cow attire and still receive a free entree. Don't know where to find a cow costume? Fear not, Chick-fil-A has you covered. Download and print off a cow costume here. Most people celebrate their birthday with cake and ice cream, but Krispy Kreme obviously prefers doughnuts! The chain turns 77 on July 11, and to celebrate they'll give you a dozen glazed doughnuts for .77 cents with your purchase of any dozen doughnuts.